Poached tropical snapper, served cold with a tomato and cucumber salsa, is best matched with bitter greens and a lemon vinaigrette. These species are often confused with the snapper (Pagrus auratus) and, although they can be prepared in similar ways, are best suited to methods and flavours recommended for coral trout. Roasting king snapper with a tasty baste of soy sauce, teriyaki sauce, coriander and chillies. Year round. Peak supply of king snapper occurs from September through February. 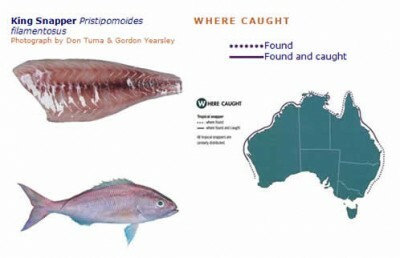 When purchasing product labelled snapper fillets care should be taken to determine whether the fillets are a tropical snapper (such as king snapper) a bream. Be sure to get what you pay for.